$15 posted in Australia. See 'contact me'. Shane Dalton gazed into the deep pool of the Boodicuttup Creek. Tree branches cast shadows over the water’s surface. Their growth so dense, the sunlight only shone on the pool during the middle of the day. “There’s the Cormorant,” Shane’s friend, Mitch Darcy, said. Shane sat with his friend, Mitch Darcy, on the outcrop of rock on the ridge. “There’s the Cormorant.” Mitch pointed to where the cormorant had emerged from an overhang of low bush forming a hidey-hole at the edge of the water. The cormorant glided across the pool to the road crossing a few metres away and clambered across the rocks. It sat on the side of the road, basking in the afternoon sunshine. A tall, gangly boy of thirteen, Shane peered through the binoculars he had sneaked from the top of the kitchen cupboard at the cormorant. “What's the Cormorant doing?” Mitch pushed his dark, curly hair back from his forehead. “Nothing. It's just sitting there.” Shane put the binoculars on his knee. “Let me have a look.” Mitch held his hand out for the binoculars. Shane passed them to him. “There's someone coming down the hill on a bike.” Mitch followed the rider with the binoculars. She dipped down the rise, then vanished out of sight before coming into view again. “It's Leanna Browning,” he said. “What’s she doing here?” Shane said. Mitch followed Leanna's progress. “She's stopped. She's leant her bike against a tree. She's creeping towards the Cormorant.” He stood to get a better view. His sudden movement startled the bird. It dived into the pool and paddled downstream to vanish among a patch of thick bush growing along the bank. Leanna rode across the creek and stopped at the side of the road below Shane and Mitch. She looked neat, dressed in jeans and a blue, checked blouse. Her fair hair was tied back in a ponytail by a matching ribbon. Shane realized how untidy he was in his grubby tee shirt and shorts. Mitch remembered the rip in the back of his shorts he had caught on a twig and sat down hurriedly on a slab of rock. “You've frightened the Cormorant.” Leanna’s voice sounded accusing. “How long have you known about the Cormorant living here?” Leanna asked. “We saw it ten days ago,” Shane said. Shane and Mitch glanced at each other. They had thought of the cormorant as belonging to them and were shocked to discover Leanna had known about it before they did. “Have you seen it fly?” Leanna asked. “No,” Shane and Mitch said together. Shane and Mitch stared in dislike at Leanna. Neither of them had thought to look in the library at school to discover more about cormorants. “Dad and I are going to search for the Cormorant's nesting place,” Leanna said. Shane and Mitch knew where there was an old cormorant-nesting colony, but they weren't going to tell Leanna. Her father was the police sergeant. Sergeant Browning had blasted them last week when they rode two abreast down the main street without their hands on the handlebars of their bikes. In the distance came a cloud of moving dust and with it the rumbling of a truck. “You'd better get off the road if you don't want to get flattened,” Shane told Leanna. Leanna pushed her bike onto the road verge. The truck flew past, enveloping her in dust. Shane and Mitch waited in anticipation for the dust to settle. When it had, they were disappointed Leanna wasn't as dusty looking as they had hoped. Jem Gasper drove across the small paddock and parked by the creek. He climbed out of the truck and started the bulldozer, then drove it off the low loader. “What's he doing with his bulldozer in old Charlie Buckle's paddock?” Shane said. “He’ll do that too, but he’ll flatten us first. We'll look like pieces of cardboard. He'll string us up under the mungji over there.” Mitch pointed across the road to a Christmas tree. “We'll blow in the wind. Backwards, forwards, backwards, forwards.” He rocked in motion. “We'll terrify everyone who travels the road of a night.” He let out a ghostly howl. “Look. There's a racehorse goanna behind you.” Leanna pointed to the rock above the two boys. Shane and Mitch turned to see a monitor lizard, nearly a metre long, perched on the outcrop of rock behind them. Mottled grey with flecks of yellow, it looked carved from stone. “Gee! It's a big one,” Mitch said. “I'd hate that to run up me in mistake for a tree,” Shane said. “So would I,” Mitch agreed. The goanna stared at them, then with a swish of its tail, it turned and vanished behind the rock. Mitch and Shane picked up their bikes and rode behind her in single file on the gravel road. “We’ll see you at school tomorrow,” Mitch and Shane called to Leanna as they reached the turn off to Mitch's Great Uncle Rolly's place. 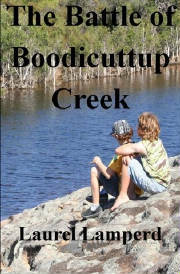 The Battle for Boodicuttup Creek is the story of two young teenage boys and a girl fighting against the damming of a creek which serves as a wildlife habitat. They are up against the power of money, the force of the bullies and the slow grinding mills of administration. But they are not easily discouraged. They create awareness in the community collecting signatures for a petition, but won't be able to stop the men in time. They have to act quickly before the waterbirds' home is destroyed for good. So they set out at night and call on the spirit of the Great Goanna to help them. The story shows that everyone is responsible for what's going on around them and everyone can make an impact for worse of better. Set in Australia the story offers an exotic world of fascinating wildlife but Boodicuttup Creek is really everywhere and it's our responsibility to protect it, whereever it still exists.